President Tsai Ing-wen stepped down as the chairperson of the ruling Democratic Progressive Party (DPP) after the party suffered a major defeat in the 9 in 1 elections that just concluded on Nov.24. The KMT (the Nationalist party) swept to a landslide victory, winning the southern city of Kaohsiung and the northeastern city of Ilan, two cities that had been strongly supported by DPP voters. DPP's number of mayors and county magistrates fall from 13 to 6 in Taiwan’s 22 cities and counties. The KMT won 15 cities and counties and incumbent Ko Wen-je, an independent, was re-elected in Taipei mayoral election. Bo Tedards, director of the International Cooperation Department of the Taiwan Democracy Foundation, said he disagreed with some media reports that the elections reflect a vote for closer cross-strait relations. Rather, he said the voters are disappointed in the DPP’s performance on domestic issues, and they voted for other parties to show their disappointment. 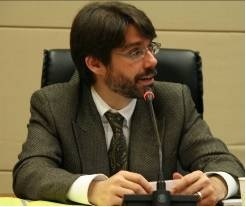 Bo Tedards used to serve as director for Amnesty International Taiwan and he obtained his BA in political science from Yale University and MA from Fletcher School of Law and Diplomacy from Tufts University.